Cotingas are restricted to the Neotropics, distributed from southern Mexico through most of tropical South America as far as northern Argentina. Although most species are found at sea level, there are several Andean forms, with species such as the white-cheeked cotinga (Ampelion stresemanni) ranging up to 14,000 ft (4,300 m). Countries harboring the most different species of cotingas include Brazil (approximately 33 species), and the northwest Andean countries (Colombia 35, Peru 31, Ecuador 30, Venezuela 27). In contrast, the countries furthest south (Argentina) and north (Middle American countries) of the equator contain only two or three species. Most cotingas are regionally restricted. While several species are found throughout most of the Amazon basin, the species with the widest distribution is perhaps the purple-throated fruitcrow (Querula purpurata), which ranges from Costa Rica through Bolivia. 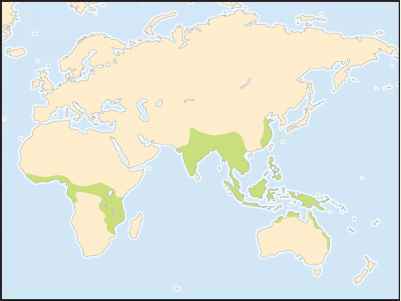 In contrast, the rarest species is the kinglet calyptura (Calyptura cristata) that is restricted to a 0.4 mi2 (1 km2) patch of forest north of Rio de Janeiro, Brazil. This species went unreported for most of the 1900s, though some recent reports from 1996 suggest that it is still present.